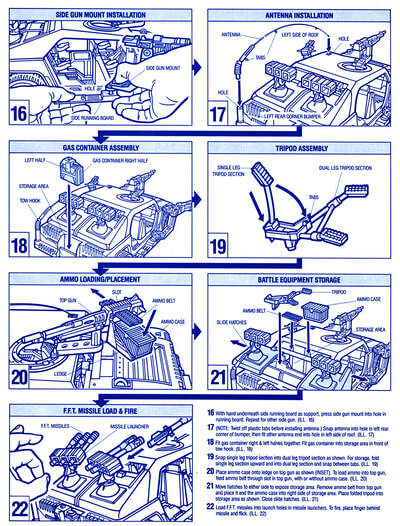 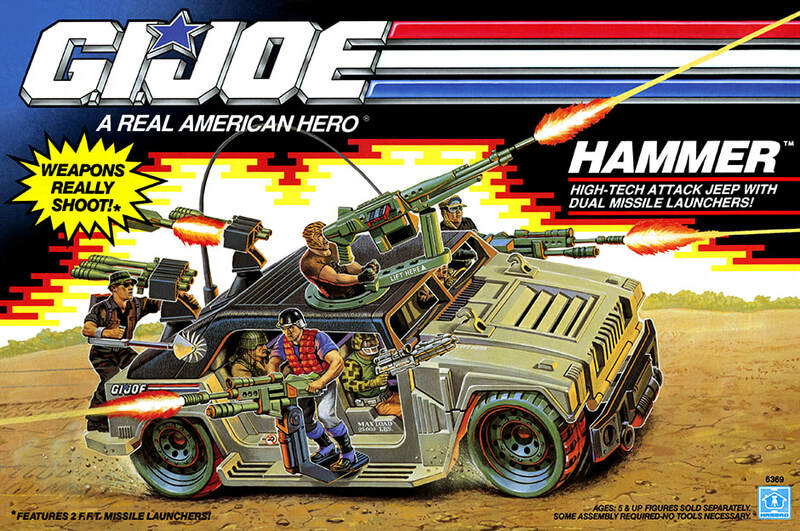 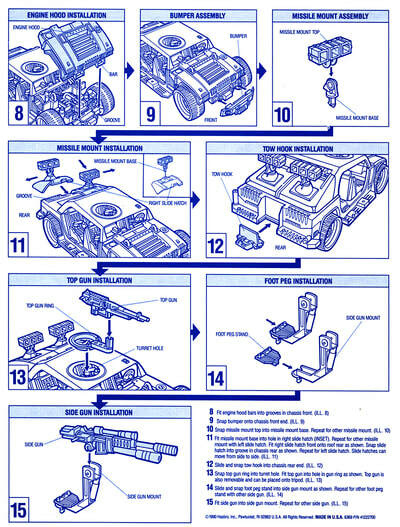 NOTE: Although the box art showed several Joes manning the Hammer, and they're pictured above, no figures were included. 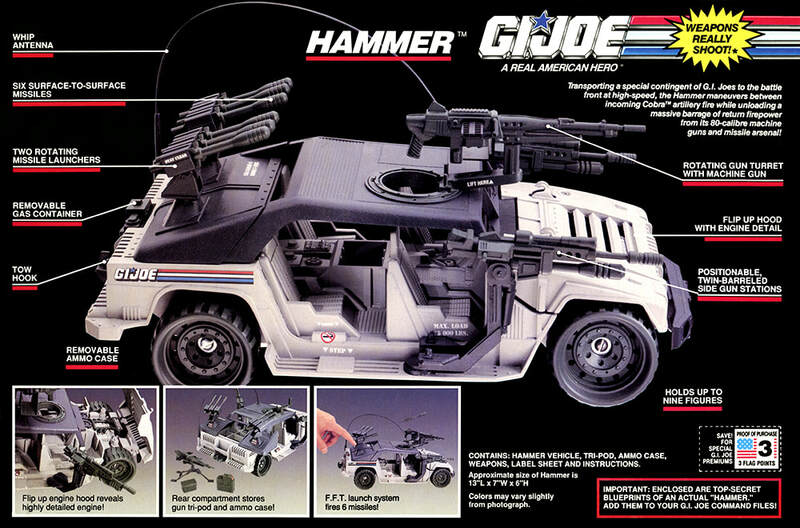 The Hammer features several moving parts and removable parts, and the sculpt is incredibly detailed. 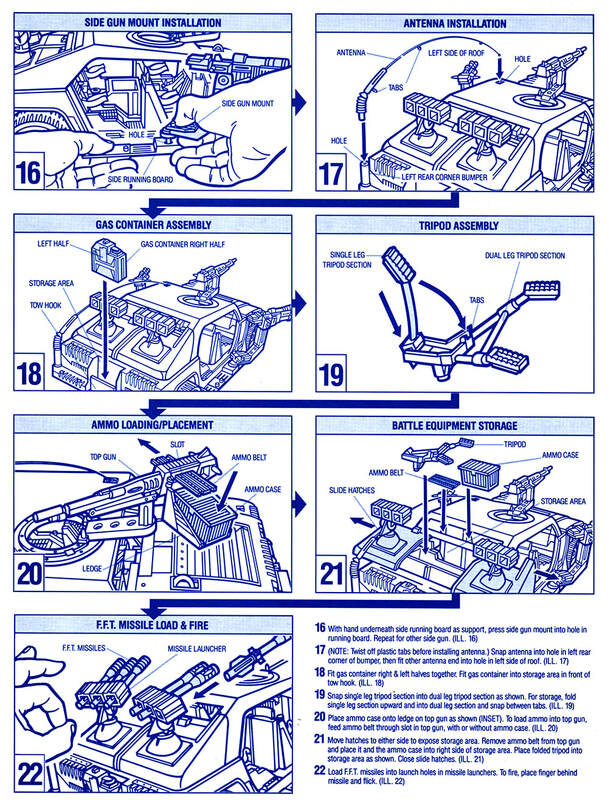 NOTE: the UHF VHF CCVT communications whip antenna shown in the above spins has been removed in the photos below. 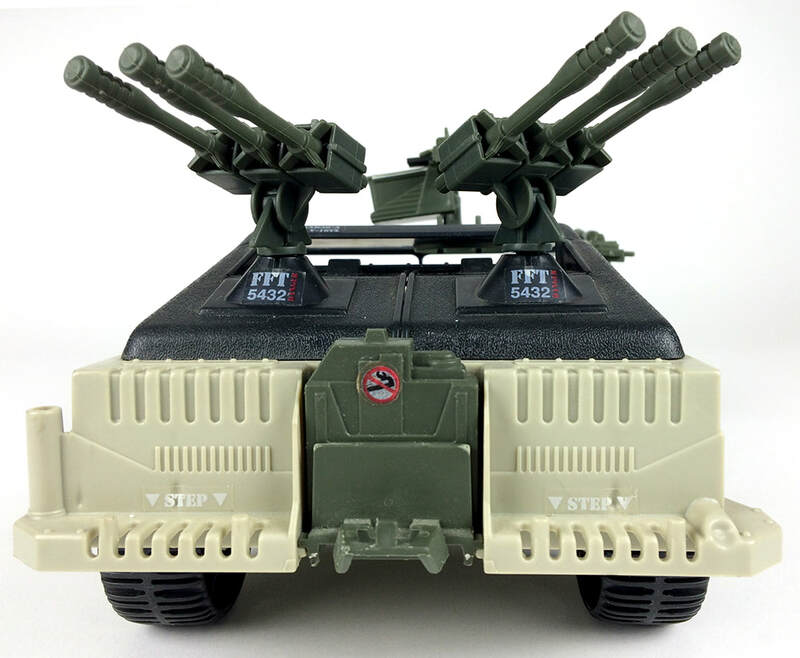 The rotating multiple launch direction missile fire stations house six surface-to-surface missiles which can be fired using the F.F.T. 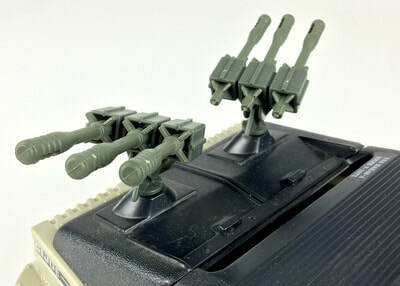 ("finger flick technology") launch system. 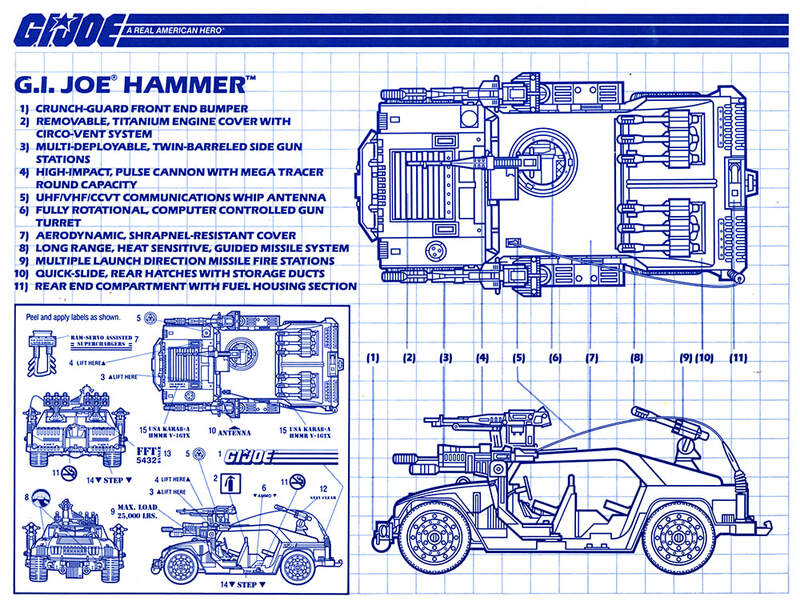 The Hammer includes six long range heat sensitive guided missiles. 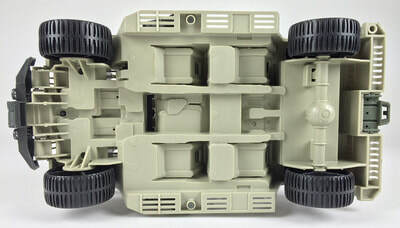 Quick slide rear hatches slide open to reveal storage ducts. 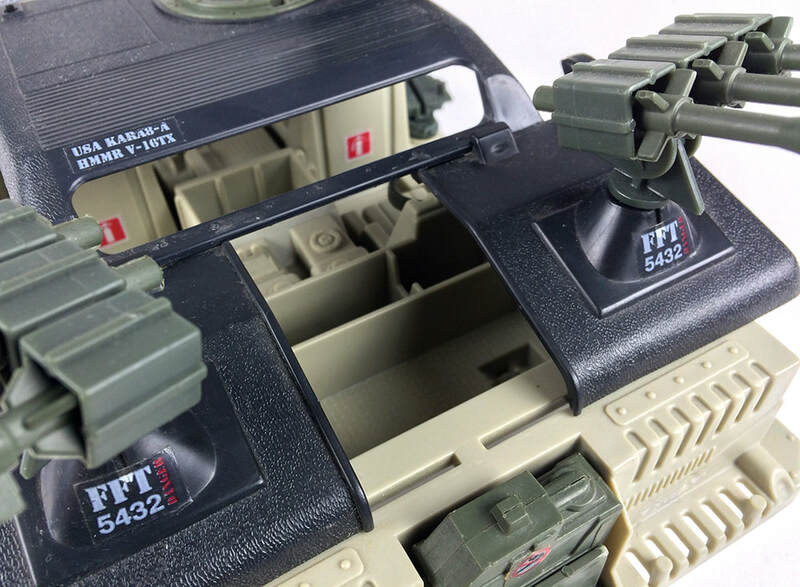 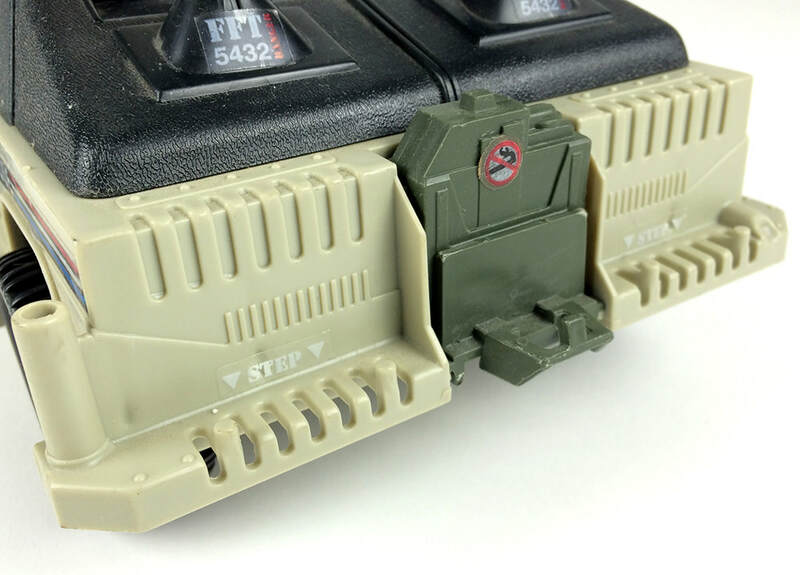 These ducts can be used to store the tri-pod and ammo case when they are not mounted to the roof. 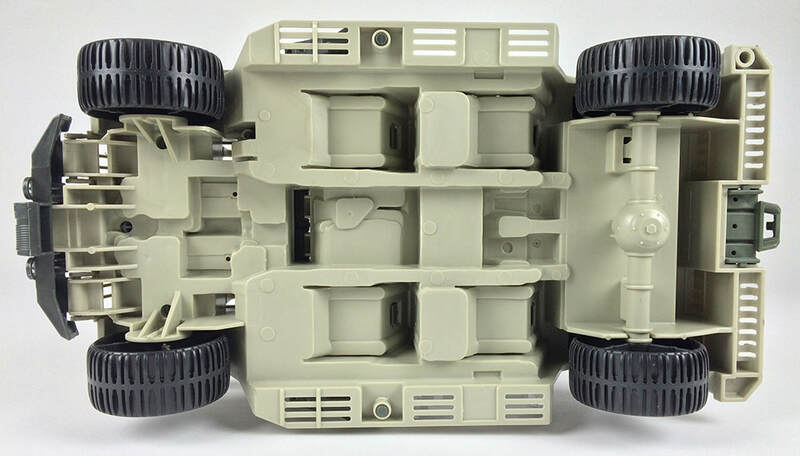 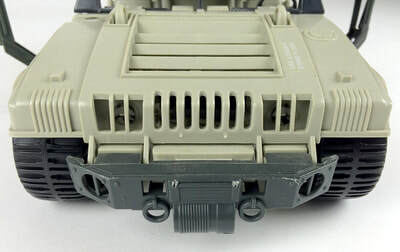 The rear end compartment features a tow hook and a fuel housing section. 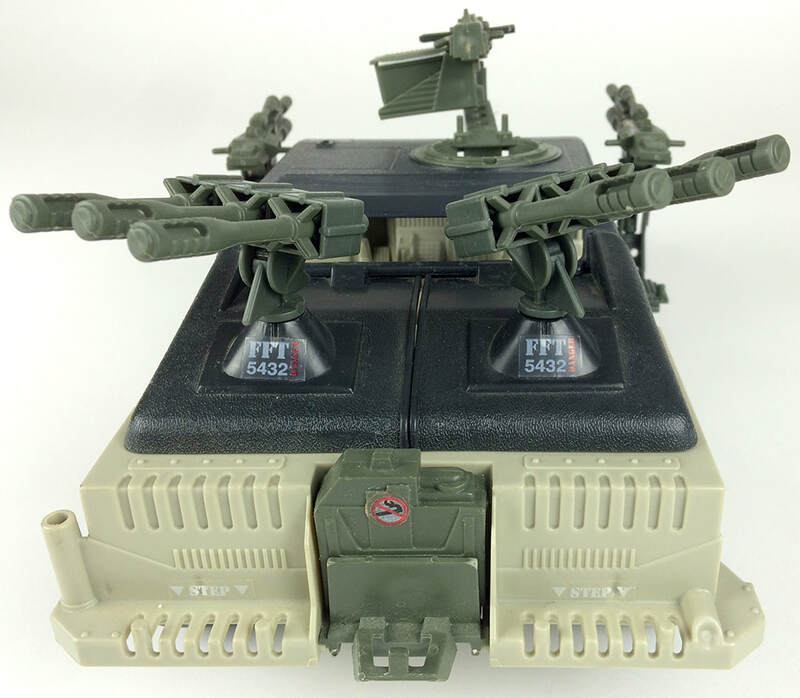 Multi-deployable, twin-barreled side gun stations swing nearly 180 degrees. The high-impact pulse cannon (with mega tracer round capacity) is mounted on a rotating gun turret. 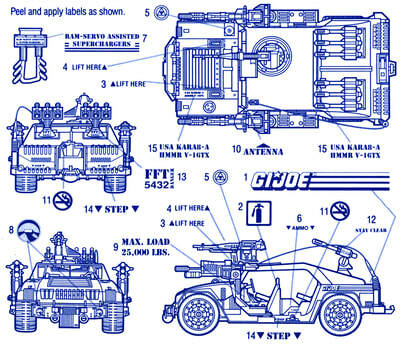 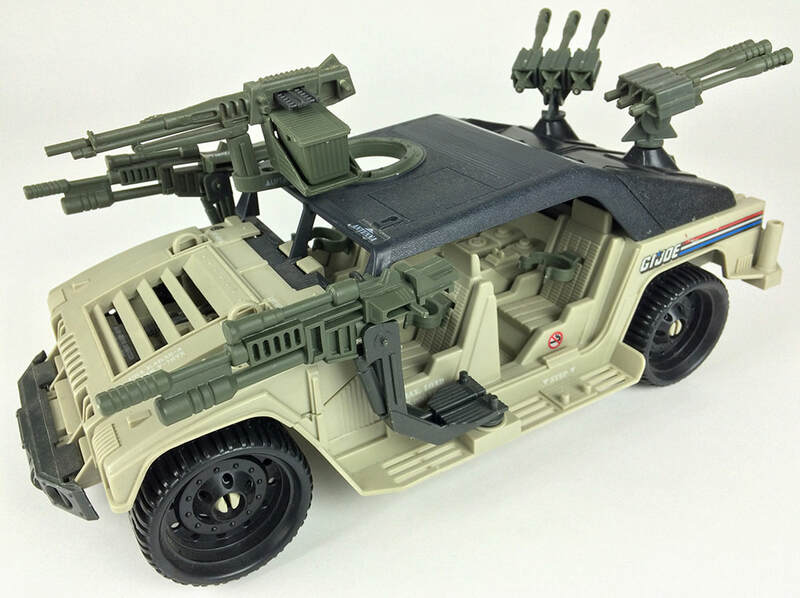 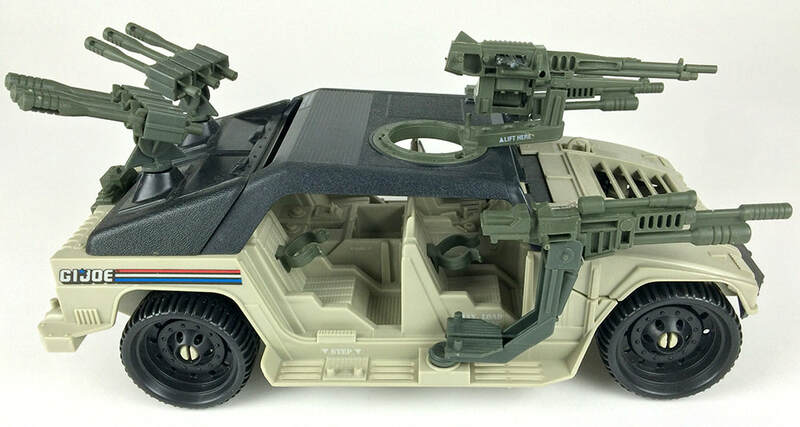 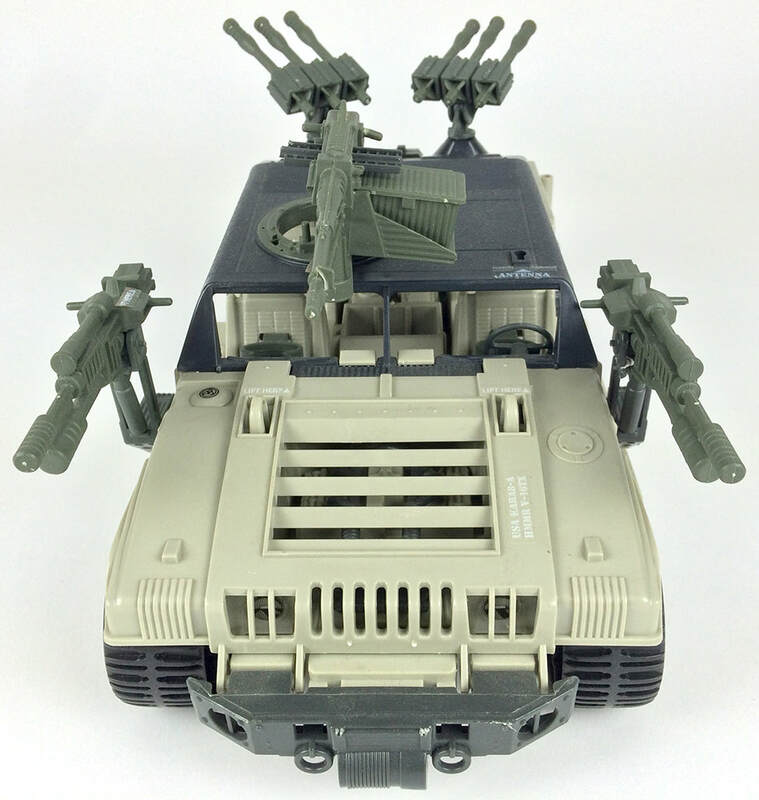 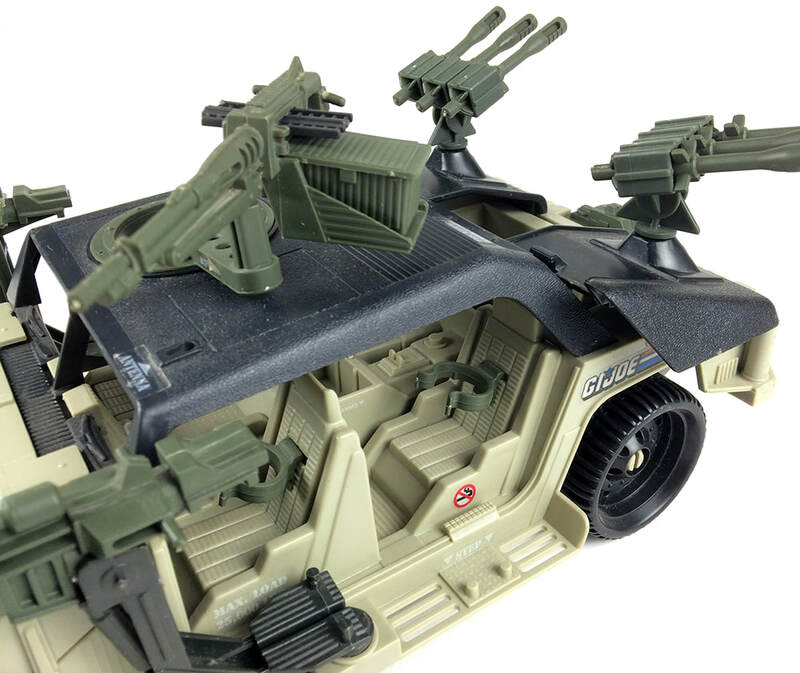 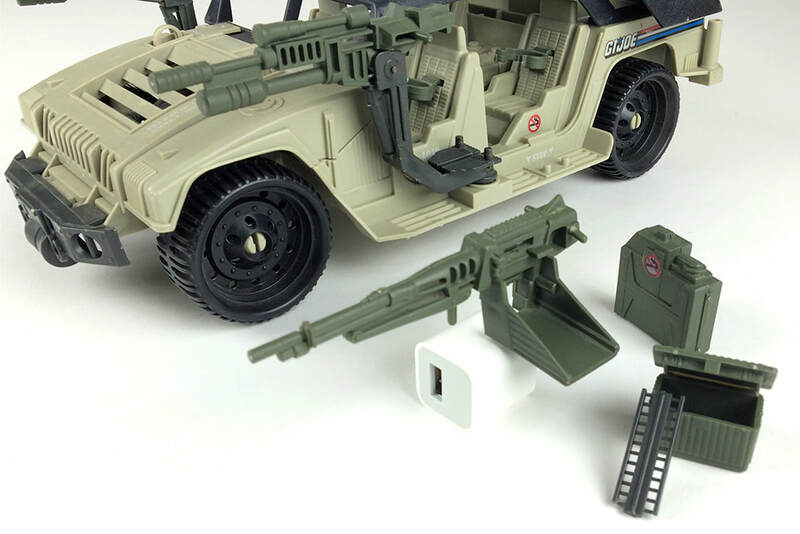 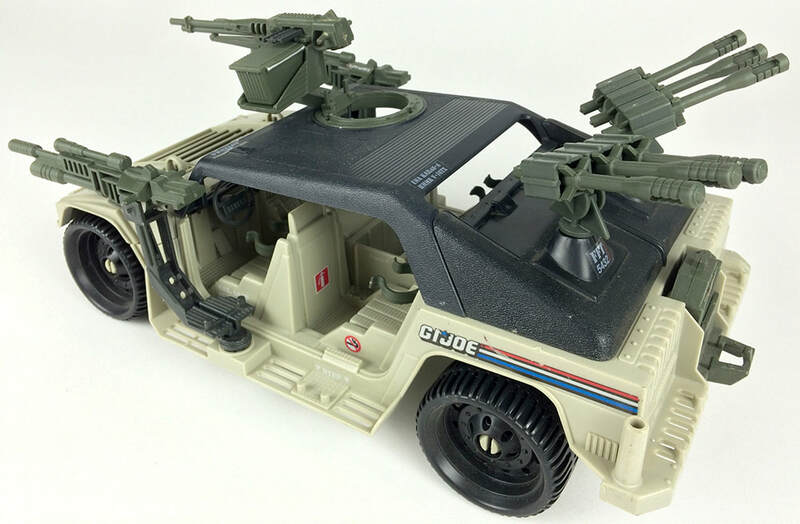 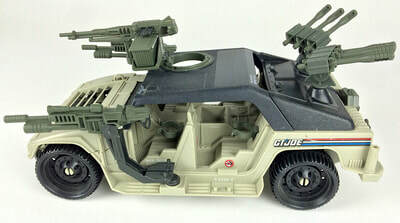 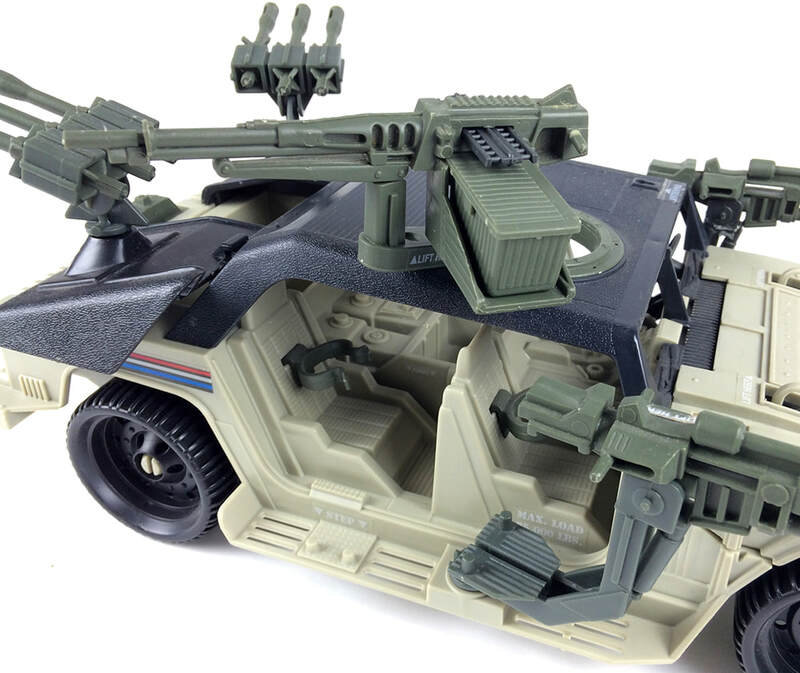 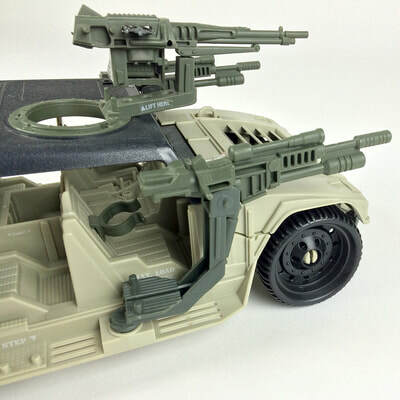 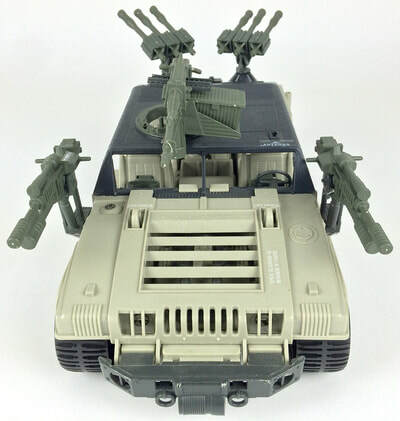 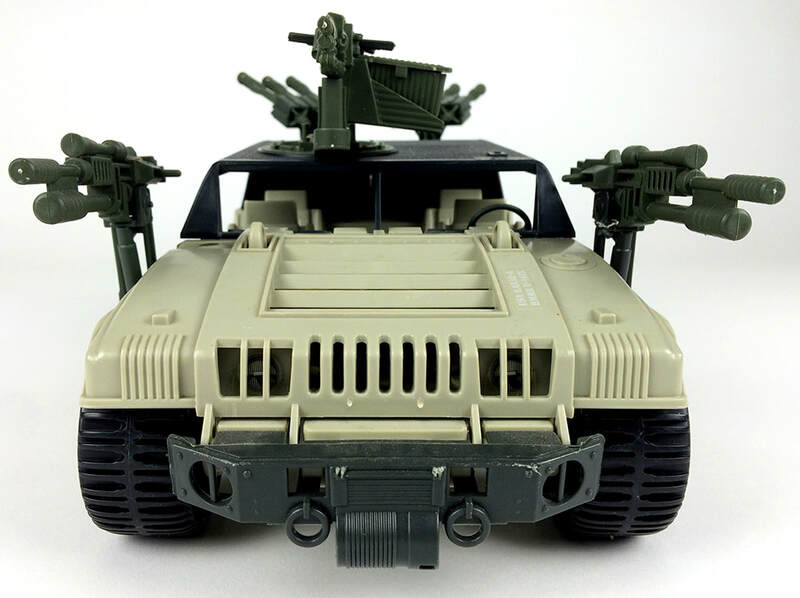 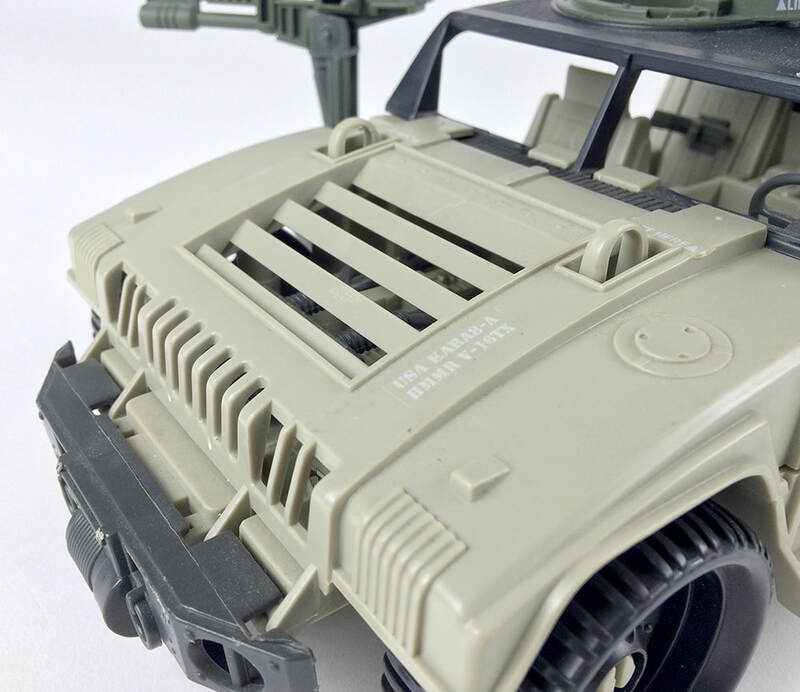 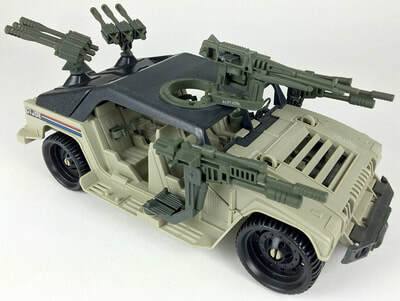 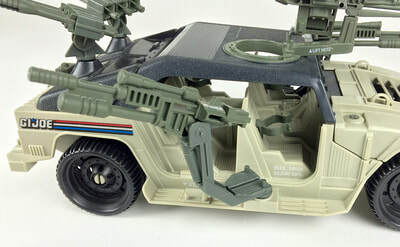 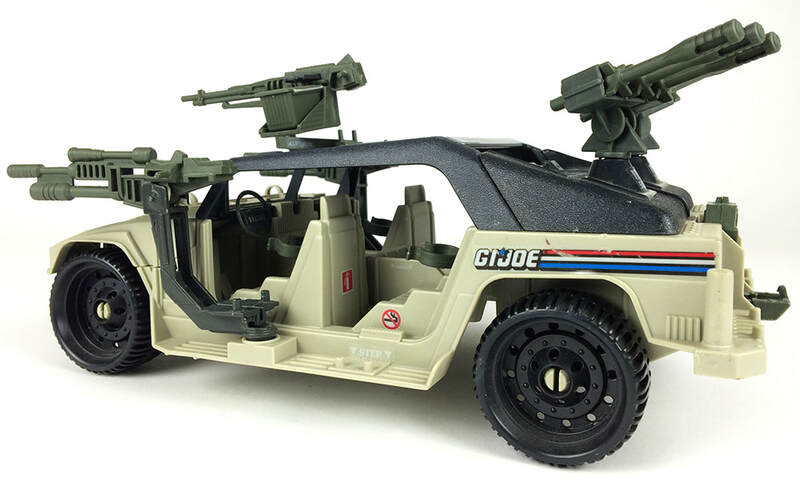 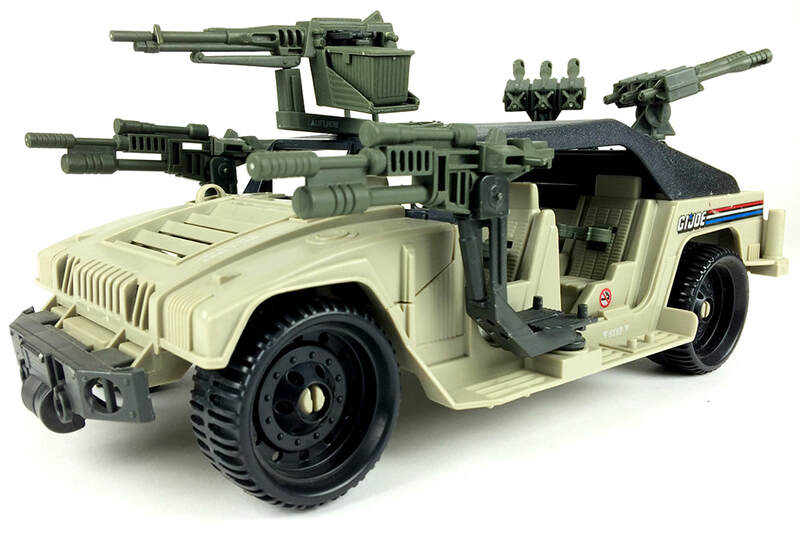 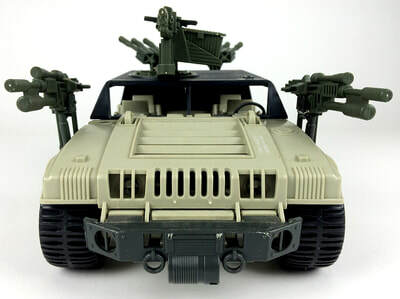 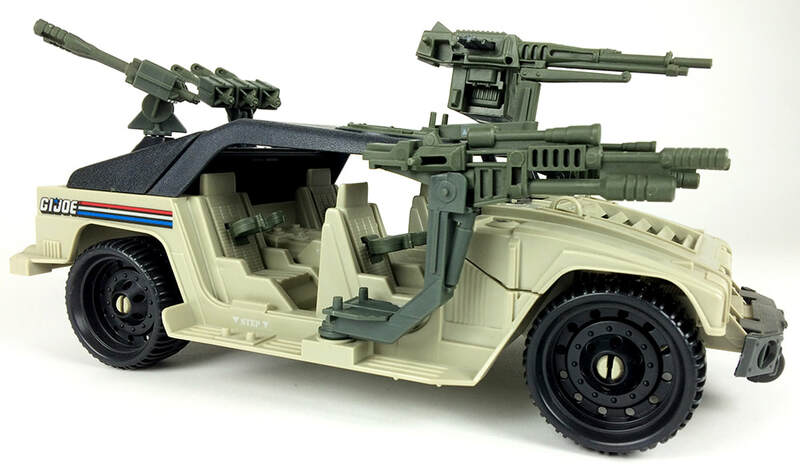 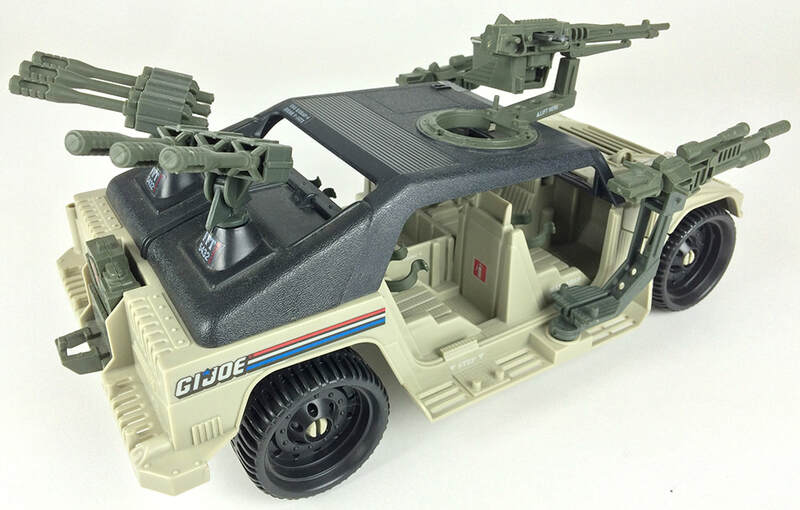 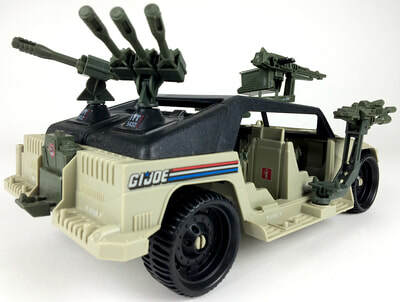 This rotating gun turret has full 360 degree functionality. 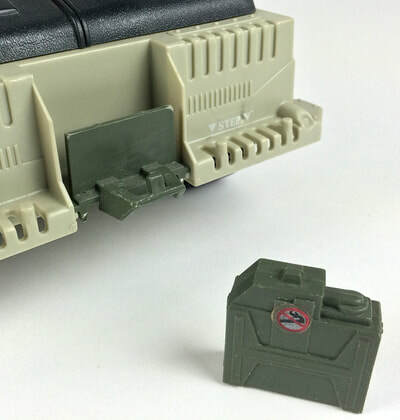 The pulse cannon, tri-pod and ammo case are all removable. 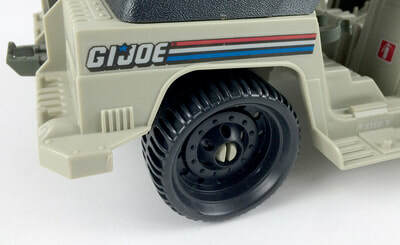 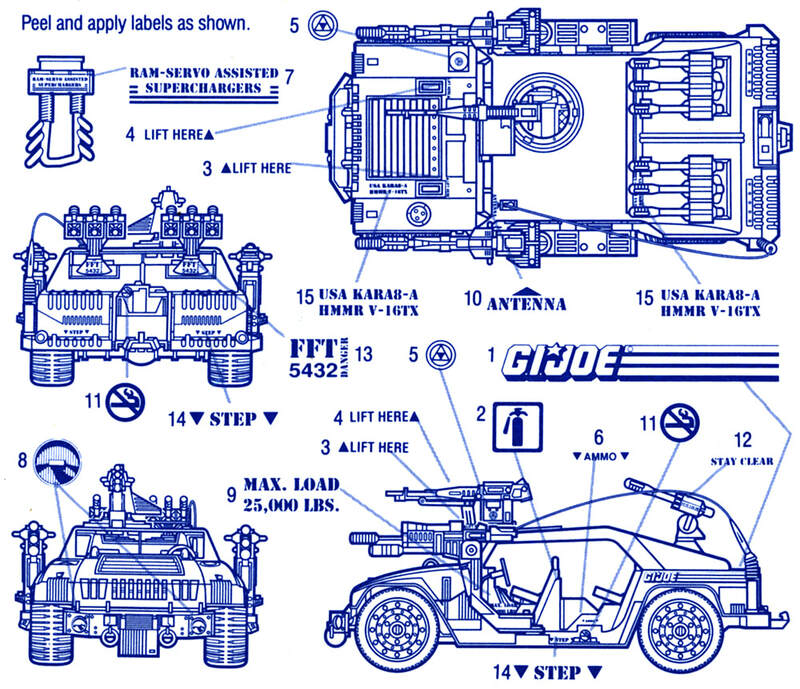 The crunch-guard front end bumper features a non-working wench. The removable, titanium engine cover with circo-vent system flips up to reveal the engine. 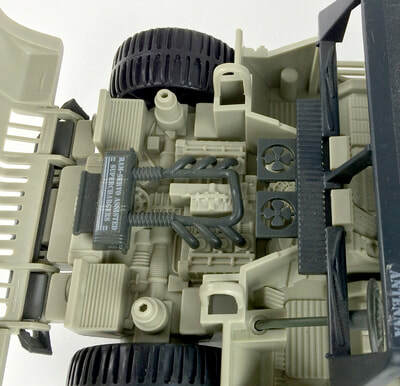 The engine compartment houses ram-servo assisted superchargers, and dual cooling fans. 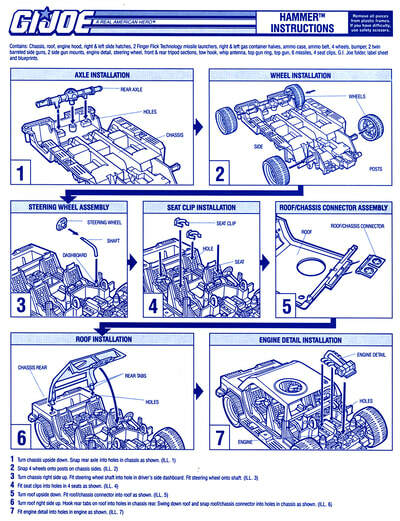 By 1990, most vehicles were hollowed out underneath as a cost cutting measure.